In part 3 of our series implementing programming language constructs with actors, we explore parallel evaluation of sub-expressions and introduce pairs. Pairs allow the construction of tuples, generalizing structured multi-part patterns and values. You may notice that the rules involving ‘,‘ are right-recursive. This means that pair expressions (and patterns) group from right-to-left. The expression (a, b, c) is equivalent to (a, (b, c)). This is important for understanding how partial matches are handled. However, before we examine the interpretation of pairs, let’s look at parallel evaluation in applications like f(x). Both the abstraction expression abs_expr and the argument expression arg_expr are sent #eval messages, but with distinct customers. The customers k_abs and k_arg are dynamically-created actors which tag messages with their own identity before sending them on the join. The join actor is also dynamically-created, and given the identities of both #eval customers, and a customer of its own. The join customer k_app receives an ordered pair of values resulting from evaluation of each expression, and sends an #apply message just like the original behavior. As mentioned earlier, tag_beh simply adds its own identity as a “tag” on the front of any message it receives. Then it sends this tagged message on to its pre-defined customer cust. This allows us to uniquely identify particular messages as coming from a specific source because the identity of a tag actor is only known (initially) to the actor that created it. A join actor uses tagged messages to distinguish between a pair of response sources. It waits until both responses arrive and then passes the ordered pair of response values on to the final customer. When join_beh receives a message, it matches the prefix against each of the tags k_first and k_rest. Based on which tag matches, the actor’s behavior changes to expect the other tagged value. Once both tagged values are received, the ordered pair of values (first, rest) is sent to the join customer cust. Figure 1 illustrates the process of evaluating a parallel application expression. A pair expression produces an ordered pair of values from an ordered pair of expressions. Like the application expression, the two sub-expressions of a pair expression can be evaluated in parallel. 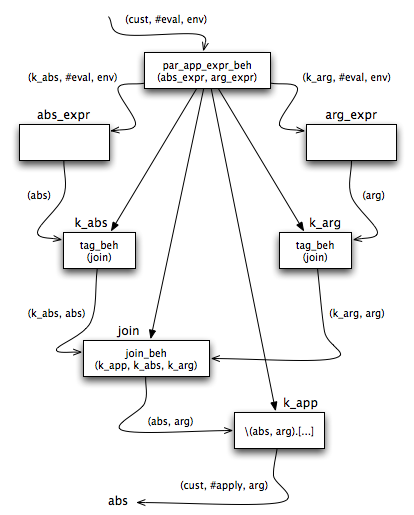 Notice how pair_expr_beh is almost the same as par_app_expr_beh (described above). In fact, pair_expr_beh is slightly less complicated because it doesn’t have to perform the “apply” step, only return the result value pair. Based on this observation, we can extract the commonality between par_app_expr_beh and pair_expr_beh into a new generalized behavior. The “call” behavior encapsulates the process of sending the same request to an ordered pair of actors and collecting an ordered pair of responses. Now we can refactor pair_expr_beh to use call_pair_beh. This behavior uses a private initialization technique to create a call actor and then replace its own behavior with one that forwards all properly-formed messages on to call. This way we can enforce that only #eval messages are allowed, while using a more generic behavior under the covers. Similarly, we can refactor par_app_expr_beh to use call_pair_beh. Again, a private call actor is created to do most of the work, but once the (abs, arg) value is available, we take the final step of “apply”ing the argument arg to abstraction abs. The final behavior required to complete support for pairs is the pair pattern. A pair pattern matches the components of a pair value against a pair of sub-patterns. This kind of pattern will only match if the corresponding value is a pair. In addition, any identifiers in the sub-patterns will be bound to the corresponding components of the value. When a pair pattern receives a #match request, it first attempts to match the head_ptrn against the head component of the pair value by sending a #match message to head_ptrn. The customer in this message k_head receives the extended environment env’ resulting from the match. The undefined value ? indicates a match failure, which is passed on to the original customer cust. If the match succeeds the extended environment env’ is passed on to attempt to match the tail_ptrn against the tail component of the pair value. The result of this match attempt is sent to the original customer cust. First we create actor representing the definition of a swap function, which exchanges the components of a pair value. Then we bind that function in a global environment global_env. Finally we send a test #eval message that specifies a customer (using assert_eq_beh) which throws an exception if it receives the wrong response. Note that when swap(x, y) is applied to the value (0, 1, 2) the variable x is bound to 0 and the variable y is bound to (1, 2). This demonstrates the semantics of partial matching between pair values and pair patterns. We’ve added two important new concepts to our evolving language evaluator. Parallel evaluation of sub-expressions and the construction of ordered pair values (with corresponding pair pattern matching). Along the way we refactored our actor behaviors to capture and use a common fork/join pattern for concurrent evaluation. By adding pairs to our language, we can now extend our single-valued function arguments and return values to accept (and return) multi-valued tuples and other structured values. The corresponding extension to our matching patterns allows recognition and decomposition of structured values built from pairs. In part 4 we will extend our pattern matching behaviors to support pattern equations. These are true equations that express relationships between patterns. They form the basis for introducing LET and IF expressions. This entry was posted in Uncategorized and tagged actor, concurrency, evaluation, functional, lambda-calculus, language, pair, pattern-matching, tuple, value. Bookmark the permalink. Post a comment or leave a trackback: Trackback URL.